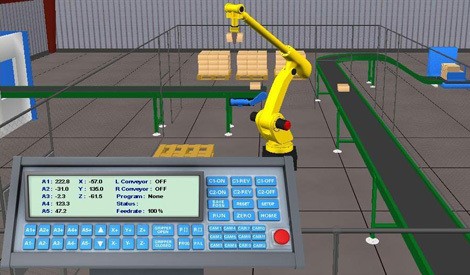 RoboLogix is a state-of-the-art robotics simulation software package that is designed to emulate real-world robotics applications. With RoboLogix, you teach, test, run, and de-bug programs that you have written yourself using a five-axis industrial robot in a wide range of practical applications. These applications include pick-and-place, palletizing, welding, painting and allow for customized environments so that you can design your own robotics application. With RoboLogix, the user can run the simulator to test and visually examine the execution of robot programs and control algorithms, while plotting instantaneous joint accelerations, velocities and positions. The RoboLogix Control Panel consists of both robot control functions as well as environment control functions such as conveyor controls, on-off hardwired control, etc. The conveyor controls are marked as C1 ON/OFF/REV and C2 ON/OFF/REV. These hardwired conveyor controls can move either conveyor in the forward or reverse direction, and override any programmed software conveyor instructions. Motion control of the robot is accomplished by moving the robot from one location (position) to another. This movement is achieved by setting the angular (A1-A5) coordinates and the linear (X, Y, Z) coordinates. Generally, angular position movements are commonly used for large (course) motion and linear position movements are often used for smaller (fine) increments. The Emergency Stop button is indicated by the large red button on the control panel. When this button is activated, power is interrupted to the entire work envelope including the robot, conveyors, and any other equipment operating in the immediate vicinity of the robot. RoboLogix provides 12 viewpoints, or camera angles, for a given robot work envelope. These viewpoints are accessed by the twelve CAM keys and allow for the viewing from a variety of angles and perspectives. By using these camera viewpoints, the user can move around in a 3D world in much the same way they would in the real-world. When programming the robot, the camera views allow you to make fine adjustments to the arm and gripper position, or to view the entire work envelope and surrounding area.